The 8th annual Hot to Trot 5K/10K and Fun Run was a great success once again! It was amazing to see over 3,000 runners and walkers out bright and early Thanksgiving morning ready to race. We feel privileged to be part of such a welcoming running community, and we're thrilled to see the Hot to Trot grow year after year! 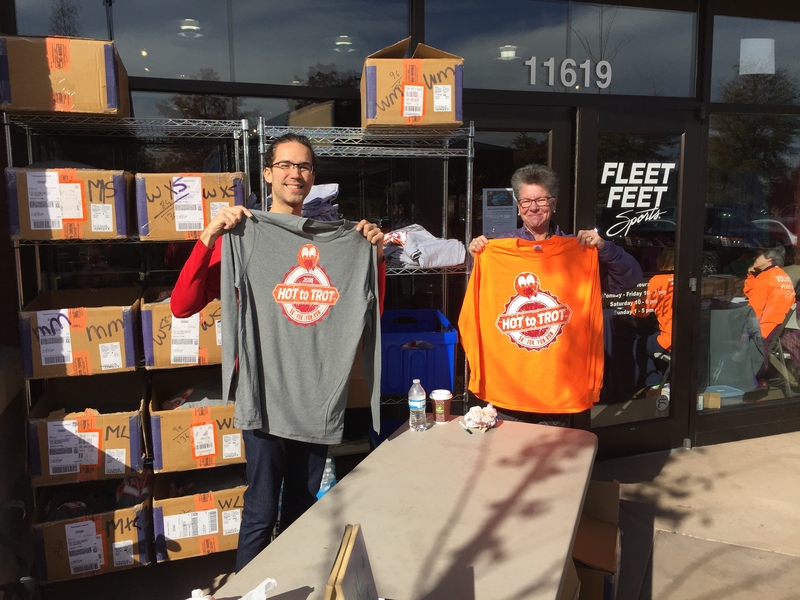 Hot to Trot is a fun way to do something active and festive on Thanksgiving, while giving back and sharing our abundance with those in need. This year, the Hot to Trot races helped to raise money for two local non-profits: A Hand Up For Women and Shepherd of Hope Food Pantry. Additionally, we were able to donate plenty of non-perishables to Shepherd of Hope - thanks to your generosity! Again, we are so grateful to all who participated and supported us, as well as our charitable partners. We hope to see you again next year! Every year we try to make the next race better than the last. Help us improve by letting us know how we did. Thank you in advance for your constructive feedback! Congratulations to our winners and to all of our finishers! Our hand-crafted awards made by Stony Clay Station are at the store ready for pick-up. To check out where you placed, see the results on our RunSignUp page! Thank you to our photography volunteers for getting some great shots at the Hot to Trot! To see the photos, please visit our Flickr! Thanks to everyone who donated to Shepherd of Hope Food Pantry this year! Your generosity has made a huge difference for local families in need. Congratulations to Henry Marambio, the winner of our raffle for a pair of New Balance shoes donated by our race sponsor, New Balance! Henry has offered to donate his winnings, so in light of the recent tragedy in Gatlinburg, we will be donating the cost of the shoe to support relief for victims of the fire. Without the support of our wonderful volunteers each year, the Hot to Trot races would not be the successes that they are. We wanted to take a moment to thank all who helped before, during, and after the Hot to Trot. Whether you helped with packet pick up, monitored the course, or prepared post-race food generously donated by Publix, your help was invaluable! Speaking of food, we'd also like to thank First Watch for feeding our volunteers! We would also like to extend a HUGE THANK YOU to our first responders - The Knox County Sheriff's Office, the Knoxville Police Department, and the Knoxville Fire Department. Without their help, the Hot to Trot would not run so smoothly! Did you flex your muscles for CrossFit Knoxville at the water stop? They once again rallied a volunteer team to pass out water on the course, keeping racers hydrated! Ladies from A Hand Up For Women, our race beneficiary, were also there in the background working as volunteers, and we would like to thank them for their hard work.